Yesterday I took the dog to the vet for a quick checkup, and as we were leaving, I spotted a beautiful, large bird feather on one of the shrubs outside the office. With great joy I said, “Look, Roy! It’s another feather for Mama!” I am a collector, of objects and of memories. I don’t remember exactly how my feather collection began, or even when, except that it was several years ago. And it is not as though I have an organized system for keeping and viewing them, or for documenting when I found each one. I tend mostly just to stick them in books or my Bible (along with the occasional pressed flower or leaf), although I have included a few in art projects and used some to make bookmarks. Someday when I am long gone, others will inherit my books and find my collected feathers inside as a little surprise. I hope they will get a smile from them. I know that these feathers come from birds, but I still like to imagine that they are dropped from the wings of some guardian angel that God has placed along my path. A childlike notion, but a comforting one just the same. God knows we all have moments when we need comfort, and I believe He sends us comforts that speak to us where we are, in a language we can understand. In telling his followers not to worry about the future or things they could not control, Jesus explained that God has numbered the very hairs on our heads, and not even a sparrow falls to the ground without The Father’s knowledge. And He values us much more than many sparrows. Indeed, nothing in my life is beyond His watchful, loving care. He sees when I am hurting, or joyful or at loose ends. He sees my frustration and fear. 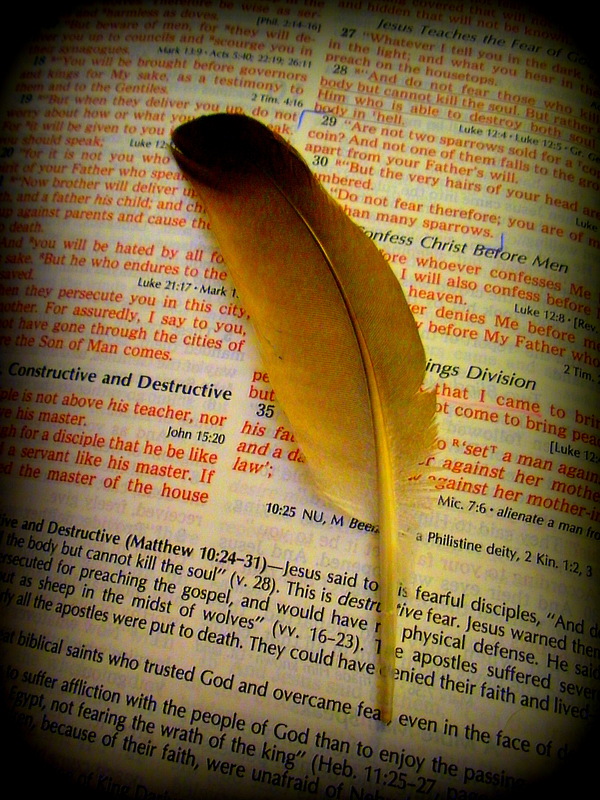 And sometimes, He places a feather in my path to remind me that He is looking out for me.